About Raccoons: These critters are very strong, and are excellent climbers. They often tip over garbage cans, enter pet doors to steal dog food, poop in swimming pools, or worse than that, they often live in the attic, where they destroy ductwork and spread waste. 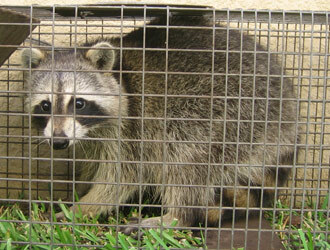 We are experts at raccoon control and removal from private homes and properties. We excel at both Arlington raccoon trapping and prevention. We are not a raccoon exterminator company, but we use techniques such as humane live trapping, prevention, and exclusion to solve your Arlington / Fort Worth raccoon problem permanently. We boast a 98% success rate, the highest in the industry, and are voted the Arlington / Fort Worth area's top wildlife animal control company. Give us a call at 817-717-3606 and we will take care of your raccoon issue for good. About Us: All Animal Control in Arlington and Fort Worth TX is a full-service, licensed and insured nuisance wildlife control company. We solve conflicts between people and Texas' wildlife. We are considered the best wildlife control company in the Dallas area, and our rates are not only competitive, but well below the average for the area. We are a small, owner-operated company, and we don't have the overhead of the big companies. Also, unlike the larger companies, we do our own work (not some underpaid and careless employee) and we take great pride in our work. Give us a call to discuss your Arlington raccoon removal project, and we will give you a price quote on the phone, and schedule a same-day or next day appointment at your convenience. We have had a mother raccoon in our attic before, she had the pups and they got old enough and left...I believe that was 2 years ago. We have been dealing with the holes in the roof that she chewed to get back in before we realized she had babies since then. (holes that still leak to this day) Anyway, about 3 days ago we saw another one crawling into a new hole under the carport, a place we didn't think the raccoon could get to. My question is - If we do not see her leave during the day does that mean she hasn't had babies yet? Can we trap and remove her without leaving babies? Does your Fort Worth raccoon control company handle situations like this? Can you perform wildlife trapping? There are no wildlife people that will deal with raccoons in our area, and no one close enough to help. What would you recommend? My husband and I moved into our new home this January. We heard scratching periodically and then found a couple of holes in the roof a few weeks after we moved in. We had the holes sealed up but a few days later we woke up to find insulation on the ground outside and a new hole. We started seeing a large raccoon about a month ago, and have seen it frequently for the last few weeks, even in the daytime. Last Thursday our guest was leaving and was stopped by a hissing raccoon on our pathway, next to a large tree. This morning my husband saw the raccoon carrying her baby in her mouth. My question is the best way to handle this. We need to seal up the holes in our roof (there are several) but we are scared of sealing up the raccoon and her young in the attic. We are pretty sure that she has a nest in the tree but what if they are also in the attic? We have coyote urine that a neighbor told us to use around the holes but I'm scared of making the raccoon leave so fast that the young are injured. I want to deal with the Arlington Texas raccoon removal situation in the kindest possible way. If we leave the holes open for a few weeks will they leave on their own? Any advice you can offer would be greatly appreciated. I do not want the raccoons to be injured in any way. We live in the Northwest area of Houston, Texas.